I lived in Los Angeles for eight years and I can attest to the fact that all of us commuters started every day singing and dancing on top of and around each other’s cars to original music. I don’t see what the big deal is. For the second time in a row ­and like his 2014 “Whiplash”, largely attributable to its whirlwind ending, I left a Damien Chazelle film thinking “WOW!” so intensely my brain wasn’t big enough to fully express it. 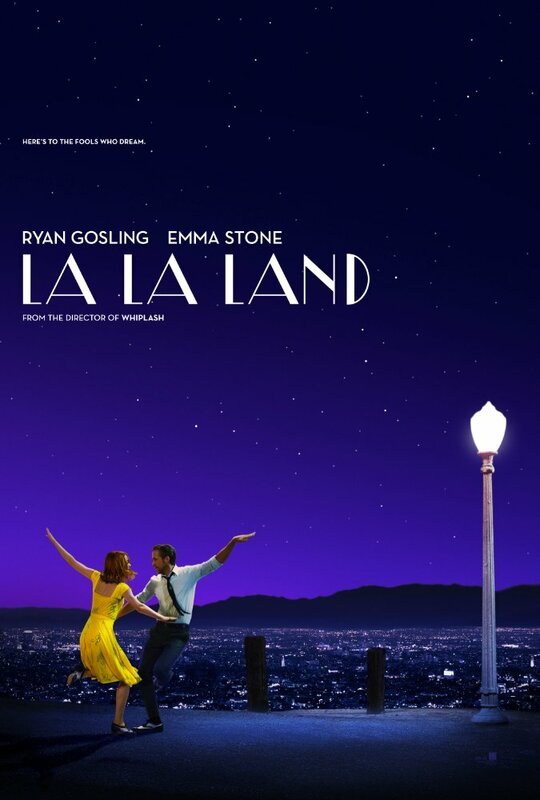 An unabashed homage to Old Hollywood musicals, Chazelle’s third feature film, “La La Land” is an enjoyable movie going experience on all counts. The closer you are to the entertainment industry and living in LA, the more you’ll enjoy it, although neither is a necessity. In terms of acting, Stone outshines Gosling, but she has the benefit of being a young actress playing a young actress and she’s showcased in the auditions and emotional scenes, especially when she conveys vulnerability. Mia has a broader range of emotions than Gosling’s character and conveys all of them convincingly, which is typical for Stone. Welcome presence J.K. Simmons, who won the Oscar for Best Supporting Actor for “Whiplash”, plays a similar hard-nosed antagonistic authority figure in “La La Land”, although he doesn’t get much screen time. Pretentiously-named pop music guy John Legend2 is good as the jazz-pop band leader who brings Sebastian on board to tour and record. Jazz purist Sebastian takes the job as a necessary means to achieve his ultimate goal of opening his own jazz club. The technicals are all impressive, especially the camera work and production design, which are much more showy than the year’s other major releases, mostly because all the other movies are based in reality. There is exceptional attention to detail in the colors of the sky, especially during several dance sequences. Musically, and like “Whiplash”, “La La Land” is grounded in jazz music and jazz performances, which smartly offset the show-tuney songs in the film. The non-jazz songs and score are enjoyable but lightweight when put into context by comparing them to the film music of Rogers & Hammerstein, the Sherman Brothers, and Alan Menken/Howard Ashman, which is an extremely high bar. If writer/director Chazelle – who won the Director’s Guild Award for the film – isn’t already considered a genius, he’s off to a solid start. I can’t fault any part of the clever writing and directing and, among other things, he’s showing aspiring directors how to grab an audience’s attention from the start and punctuate a film resoundingly. Going forward, I’m curious to see how well he does outside the realm of music, particularly jazz music, although I appreciate how he wants to raise the visibility of jazz in the public’s consciousness. 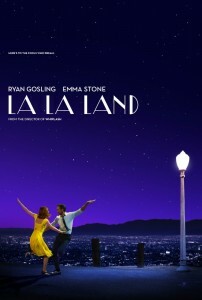 The year’s most elaborate production (and only non-drama among Oscar Best Picture nominees), “La La Land” has matched the 14 Oscar nominations of Joseph L. Mankiewicz’ 1950 “All About Eve” and James Cameron’s 1998 “Titanic.” I’ve read headlines questioning all the film’s nominations but, going through them one by one, there is no nomination I don’t think the film deserves, the possible exception being Gosling (see Ben Foster in “Hell and High Water”, where he makes up for less screen time with authenticity and controlled and nuanced intensity). Although there are still a few films I need to see, I’m not sure this isn’t a weak year for Oscar-caliber movies. I say that every year then end up happily eating my words. Despite the back-in-MY-day criticisms, “La La Land” is entertaining, as emotionally-engaging as a fantasy can be, energetic, reverent, an unquestionably great production and exactly the escapism we need right now. After seeing it twice, I think it benefits from multiple viewings because the production is so dense and fast-moving. I’m not good at calling my choices for Oscars until the day of the show but, at minimum, Best Picture (all but guaranteed with its Producer’s Guild Award), Cinematography and Production Design are pretty much a lock. 2 John Legend’s real name is John Roger Stephens. He seems to have borrowed the idea for his stage name from the much more aptly-named Stevie Wonder, which emphasizes how derivative he is. You can talk about his popularity, record sales, Grammys and Oscar all day long and I’ll still only hear the logical successor to Bobby Short’s gig at the Cáfe Carlyle in Manhattan. As a vocalist alone, he can’t stand in the shadow of present-day Wonder. Even worse, he married a supermodel and is constantly in tabloid-esque news stories. He is yet another on the ever-growing list of attention-starved celebrities for whom the words “humility”, “privacy” and “overexposure” don’t exist. As part of an Air Force family, I went to elementary school in Great Falls, MT, junior high in Cheyenne, WY and high school and college in the San Francisco Bay Area, graduating from San Francisco State University with a degree in business. I was fortunate to have worked for great companies in Silicon Valley (Oracle Corp) and Hollywood (Miramax Films). I also lived and worked (primarily in financial services, which has no great companies) for eight years in Manhattan, New York City. I now reside in New York's beautiful Hudson Valley. Great review Dan- As a result – I will make a point to see this.